In 1812 Alphonse de Lamartine, a young man of means, traveled through southern Italy, where, during a sojourn in Naples, he fell in love with a young woman who worked in a cigar factory—and whose death after he returned to France would haunt him throughout his writing life. 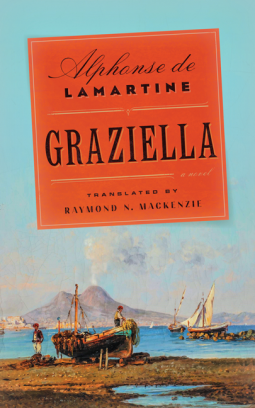 Graziella, Lamartine called this lost girl in his poetry and memoirs—and also in Graziella, a novel that closely follows the story of his own romance. “When I was eighteen,” the narrator begins, as if penning his memoir, “my family entrusted me to the care of a relative whose business affairs called her to Tuscany.” The tale that unfolds, of the young man’s amorous experiences amid the natural grandeur and subtle splendors of the Italian countryside, is one of the finest works of fiction in the French Romantic tradition, a bildungsroman that is also a melancholy portrait of the artist as a young man discovering the muse who would both inspire and elude him. Remarkable for its contemplative prose, its dreamy passions and seductive drawing of the Italian landscape, and its place in the Romantic canon, Graziella is a timeless portrait of love, chronicling the remorse and the misguided ideals of youth that find their expression, if not their amends, in art.